Steam distilled rosalina leaf essential oil from Australia. 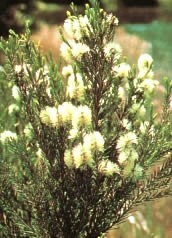 Species: Melaleuca ericafolia, Family: Myrtaceae. Aromatherapy uses include: Anti-bacterial, anti-viral, anit-fungal. It may be used topically in a similar way as tea tree oil. it has also been used internally and with inhalation. Aeracuras' rosalina essential oil has a soft, piney, earthy and floral aroma.